The Maryland/DC area can be a really tough area to navigate. It's hard enough to figure out the different cities, counties, and school districts. The best way to learn this information is from other military families. This PCS Guide to Ft Meade/Annapolis Area is a compilation of information from other military families. Download the full PCS guide with maps to see where the neighborhoods are located, metro maps, school boundaries and much more! 1. You need a realtor to help look for houses to rent or buy. The property market moves fast here. If you are looking at homes across state lines, make sure your realtor has licenses for different states (Virginia, DC, and/or Maryland). Find a recommended Military Friendly REALTOR near Fort Meade. Read real estate agent reviews from other military families. 2. Find out if the house has public utilities or septic tank and well water. This can make a big difference when power goes out with a hurricane or Nor’easter storms. 3. In Maryland, HOAs are the norm for the state. Some areas may not have any fees while other have monthly or yearly fees. If buying a home, HOA fees can be an important factor. If you are renting, make sure there isn't a clause about HOA fees. Again, this is why a real estate agent can really help you navigate this area! 5. Your spouse will work long hours. There aren’t as many military run social groups in this area, so join social groups outside the military, such as Junior League, MOPS, etc. Get out and meet people and you will enjoy your time better. 6. Research the different counties and the school districts in the different counties. 7. Check current school boundaries before renting or buying a home. 8. There are more government contractors, retirees and reservists in the area than active duty. 9. Consider enrolling in US Family Health Care Plan for the area. You will have access to Johns Hopkins physicians. Read more. Montgomery- Montgomery county is pretty much known for good schools. Read more about Montgomery County. Howard- Make sure the school boundaries haven’t changed when you buy a home. The main population center of Columbia/Ellicott City was named second among Money magazine's 2010 survey of "America's Best Places to Live. Many of the most affluent communities in the Baltimore-Washington Metropolitan Area are in Howard County. Many areas of Howard County have high HOA costs. Anne Arundel- Known for good schools, however the administration has been changing a bit, so do your research and make sure the schools are still up to par. Prince George – A more diverse county with lower socio economics. Schools have been poor in the past, but administration has been changing so you may see improvement in the future. If you buy a house, you will pay state property taxes and county taxes in this county. It may seem houses are cheaper here, but consider the overall taxes and consider the schools. Prince George has the highest property taxes in Maryland. Annapolis, home to the US Naval Academy, is a very friendly and fun Navy Town. Situated right on the banks of the Severn River and the Chesapeake Bay, this colonial style town, which is also the Capital of Maryland, offers a very popular and fun downtown area with lots of historic sites, unique shops, and wonderful restaurants. Known as the Sailing Capital of the US, there are numerous marinas and water recreation is a large part of the community. There is also another side to Annapolis, which is newer and more suburban in feel. The recently developed Parole Town Center has a nice variety of higher end shopping and restaurant chains, and is nearby to the very popular and large Annapolis Mall. Schools in Annapolis are probably the biggest negative – the public schools are not regarded as very good, although there are lots of good private school options. The biggest drawback of the area is that if you aren’t stationed at the Naval Academy, you’re looking at a pretty long commute time, of at least 45 minutes to an hour to DC. If living in an extremely charming, waterfront town makes a commute on US 50 and the Beltway worth it for you, then go for it! It’s a wonderful place to live. Schools in Annapolis are aligned to Anne Arundel County. Nearby Neighborhoods: Family friendly neighborhoods near Annapolis. Commuting to Meade – 40-50 minute drive from Ft. Meade to Annapolis. 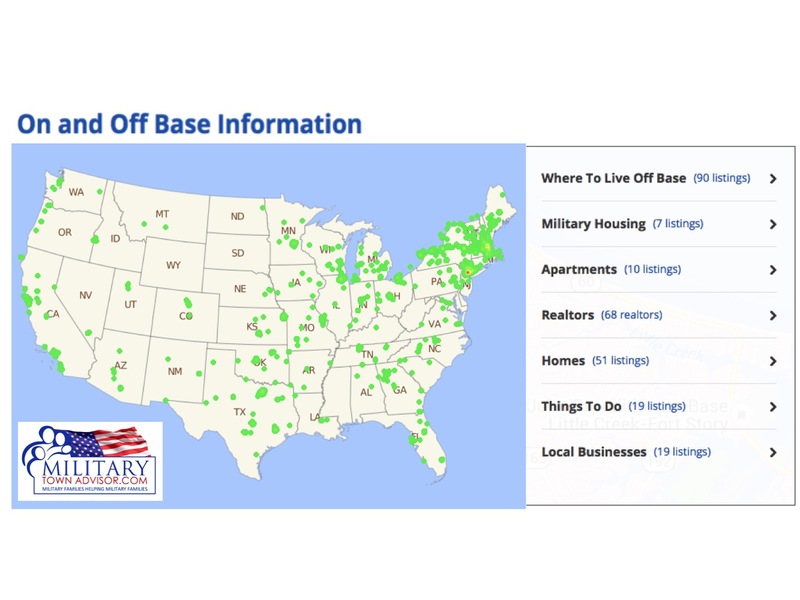 Ft Meade has on-base housing at the base. If you have school aged kids, the schools aligned to base housing are not the best. The elementary school is fine because it is made up of a lot of military kids who live on base, however the middle school and high school pull more from areas off base near Ft. Meade. A lot of people home school their kids if they choose to live on base. Check the water supply in nearby areas. Reports of contaminants have been reported over the past years. The base has a great commissary and clinic. Schools around Ft Meade are not DoD schools, they are aligned to Anne Arundel County. Nearby Neighborhoods: Family friendly neighborhoods near Forte Meade. Ellicott City, MD is located Howard County and is a bit more rural. The schools are very good there and the neighborhoods are a bit more diverse. This area is close to Baltimore so you are close to restaurants, shopping, and entertainment. Named Best Places to Live in 2010 by Money Magazine. Schools in Annapolis are aligned to Howard County. Columbia, MD is a master planned community comprising of 10 self-contained villages. It is a great area to live, especially when stationed at Ft. Meade. The city has great schools and it’s very nice. It’s a bit pricey and overcrowded, but a really popular area for military families to live. Named Best Places to Live in 2010 by Money Magazine. The city of Fulton is nearby and may be one of the wealthiest areas in the state. Schools in Annapolis are aligned to Howard County. Nearby Neighborhoods: Family Friendly Neighborhoods near Columbia, MD. Commuting to Ft. Meade – 32 West can get really crowded with traffic during rush hour. 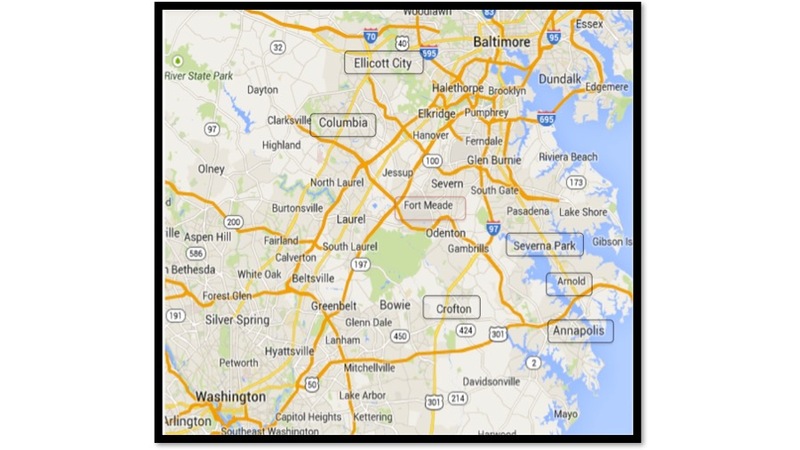 Laurel is located in 4 counties; Howard, Anne Arundel, Montgomery, and Prince George. There are good parts and bad parts of Laurel and a lot depends on which section is in which county. Nearby Neighborhoods: Family friendly neighborhoods near Laurel, MD. Crofton is a great community with great schools. The location is conveniently located between DC, Ft. Meade and Annapolis. Named the best place to live in 2007 by Money Magazine. “Old Crofton” was a planned commuter community located between Annapolis and DC. The neighborhood has sidewalks, playgrounds, and neighbors are very friendly. Schools are aligned to Anne Arundel County. Nearby Neighborhoods: Family friendly neighborhoods near Crofton, MD. Severna Park is a great neighborhood with great schools. There is a little beach access in Severna Park and you are close to Annapolis for great shopping. It’s a pricey area, but really nice. Schools are aligned to Anne Arundel County. Arnold has great schools in the state. It’s a great place to live and conveniently located between Annapolis and Ft. Meade. Schools are aligned to Anne Arundel County. Nearby Neighborhoods: Family friendly neighborhoods near Arnold, MD. Nearby Neighborhoods: Family friendly neighborhoods near Rockville, MD. Commuting toother bases - To commute to other Bases in the area, it is necessary to take the Beltway. Nearby Neighborhoods: Family friendly neighborhoods near Gaithersburg, MD. Nearby Neighborhoods: Family friendly neighborhoods near Kensington, MD. Many families refer to surrounding counties rather than city names. 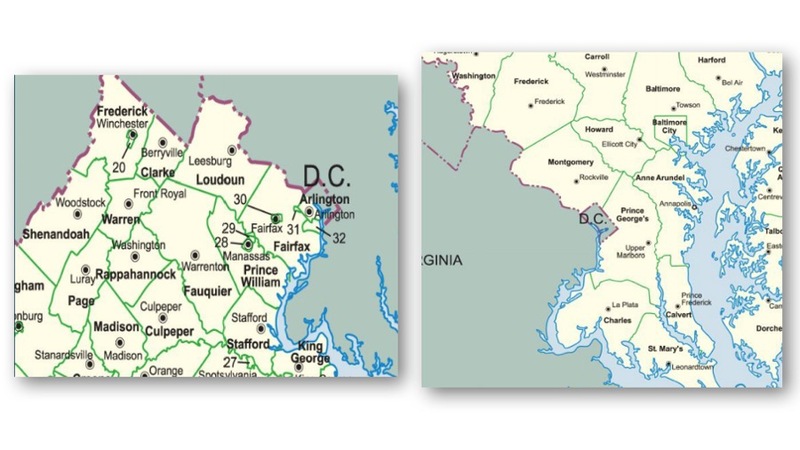 Below are maps of counties in Virginia and Maryland. Pentagon Info - Read where to live reviews, find REALTORs, homes, and things to do near the Pentagon. Meade Info - Read where to live reviews, find REALTORs, homes and things to do for Ft Meade. Annapolis Info - Read where to live reviews, find REALTORs, homes and things to do for Annapolis. Quantico Info - Read where to live reviews, find REALTORs, homes and things to do for Quantico. Whether you are looking to buy or rent a home near Fort Hood, search our large database of Military Friendly Realtors near Fort Meade. Real estate agents can help you narrow down your search and keep you in the loop when houses come on and off the market. Search MilitaryByOwner's military homes for sale or rent near Fort Meade and military homes for sale or rent near Annapolis.